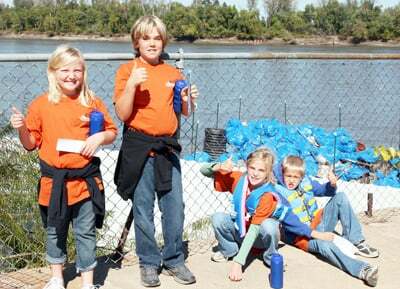 Young helpers in the Big Muddy Clean Sweep cleanup of the Missouri River in Washington give the effort a thumbs up Saturday, Oct. 15. From left are Olivia Brock, Ethan Strubberg, Claire Strubberg and Brennan Strubberg. The cleanup was organized by Missouri River Relief, a nonprofit group that leads educational and cleanup efforts on the river. 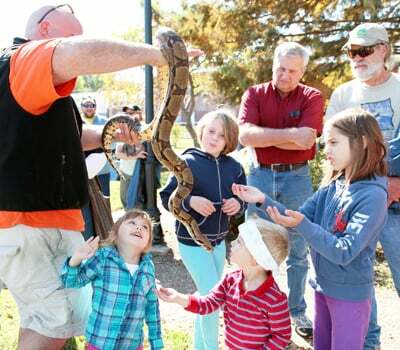 Curious children gathered around to see this red-tailed boa that was among the many creatures on display at the Wyman Center exhibit Saturday, Oct. 15, during the Washington River Festival and Big Muddy Clean Sweep. The day included educational and hands-on activities, live music and a cleanup of the Missouri River. Team members from Kohl’s took part in the cleanup of the Missouri River at Washington Saturday morning, Oct. 15, as part of the company’s Kohl’s Cares program. The river cleanup was organized by Missouri River Relief, a nonprofit group that leads educational and cleanup activities along the Missouri River, and its Big Muddy Clean Sweep effort to clean sections of the Missouri from Jefferson City to St. Louis. The Big Muddy Clean Sweep and Washington River Festival was held Saturday, Oct. 15. The cleanup was organized by Missouri River Relief, a nonprofit group that leads educational and cleanup efforts on the river.